In order to investigate the environmental impacts of the Laacher See eruption (12900 calendar years B.P.) and the deposition of the Laacher See tephra on the landscape of NE Germany at a large distance from the volcano in the Eifel, fine-resolution micromorphological, diatomological, and palynological investigations were carried out on closely spaced areas in the Reinberg basin (Vorpommern, NE Germany). Next to pollen and diatom analyses from core Reinberg C, high-resolution pollen analyses of core Reinberg I were supplemented with diatom and micromorphological analyses of core Reinberg D and its test-core. A comparison with other sites in Mecklenburg-Vorpommern (NE Germany), e.g. Crednersee, Horst 2, Schwarzer See and Plauer Stadtwald - enabled a regional comparison. Climate and environment were already unstable in the area of NE Germany prior to the Laacher See eruption. The minor cooler Gerzensee fluctuation came to an end and temperatures had started to rise. 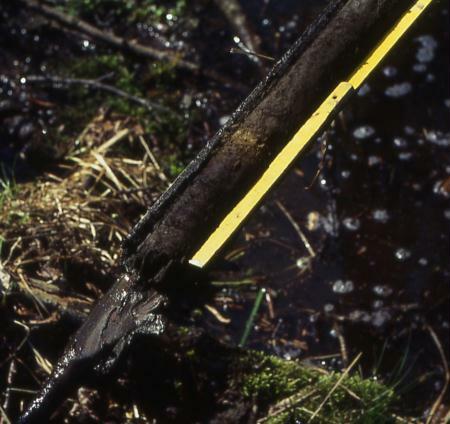 At several localities local hydrological conditions might have triggered the expansion of birch carrs along the basin margins. When the Laacher See volcano erupted around 12900 cal. yr. B.P., a tephra layer of uncompacted thickness over 0.5 cm thickness covered NE Germany. In limnic environments the bottom part of the Laacher See tephra was deposited from atmospheric input by the fall-out itself, whereas the upper part was washed-in from the surrounding catchments. Limnic diatom populations profited greatly from the input of silica by the tephra, which functioned as a nutrient source for the building of frustules and simultaneously prevented dissolution of dead diatoms. The tephra also provided a favourable habitat for many epipelic and epilithic taxa. This effect was only temporal and terminated when the LST was covered by new lake sediments. The water became temporarily slightly more acid and had a slightly higher specific conductivity. Although the eruption of the Laacher See volcano certainly caused temperatures to decrease, this decrease was too small and too short to greatly affect vegetation and environment. Eutrophication and direct damage by the tephra to the vegetation also seem not to have played a a major role in NE Germany. Temporarily increased precipitation caused increased soil erosion and rises of water-levels. A pioneer vegetation of plants growing in moist environments might have expanded on moist areas that emerged after water-levels had fallen again. Dryland pioneer plants inhabited sites that were opened by fire, which relates to an increased lightning during violent thunderstorms connected with the ash-cloud from the volcanic eruption emitted in north-eastern direction. This research was carried out in close cooperation with Martin Theuerkauf, Peter Kühn and Wolfgang Janke. 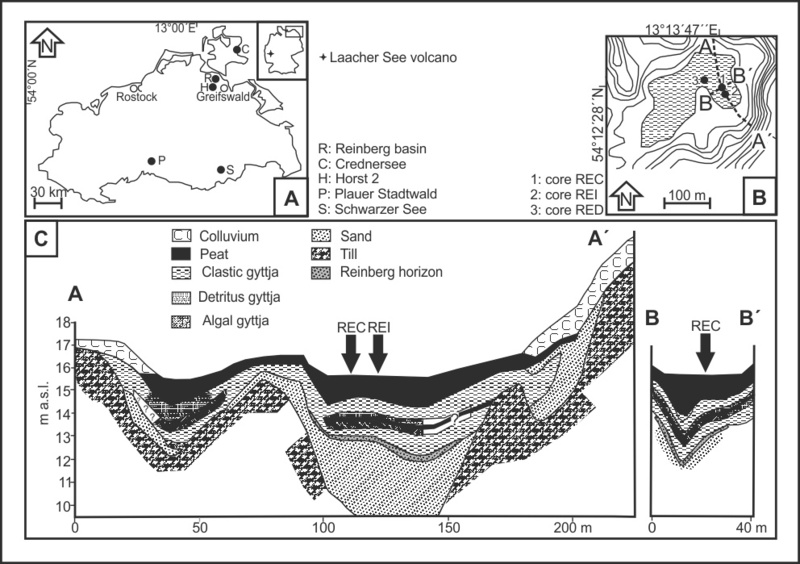 De Klerk, P., Janke, W., Kühn, P. & Theuerkauf, M. (2008): Environmental impact of the Laacher See Eruption at a large distance from the Volcano: integrated palaeoecological studies from Vorpommern (Germany). Palaeogeography, Palaeoclimatology, Palaeoecology 270: 196-214. De Klerk, P. & Helbig, H. (2006): A pollen diagram from a kettle-hole near Horst (Vorpommern, NE Germany) covering the later part of the Weichselian Lateglacial. Zeitschrift für geologische Wissenschaften 34: 379-387. De Klerk, P., Helbig, H. & Janke, W. (2008): Vegetation and environment in and around the Reinberg basin (Vorpommern, NE Germany) during the Weichselian late Pleniglacial, Lateglacial, and Early Holocene. Acta Palaeobotanica 48: 310-324. Kleisle, K. & Müller, H.M. (1969): Neue Fundpunkte spätglazialer Bimsaschen im Nordosten der DDR. Geologie 18: 600-607. Kliewe, H. (1995): Vulkanasche aus der Eifel in Nordrügen: ein erdgeschichtlicher Rückblick. Rugia Journal 1996: 52-55. Müller, H.M. (1965): Vorkommen spätglazialer Tuffe in Nordostdeutschland. Geologie 14: 1118-1123. Schmincke, H.-U., Park, C. & Harms, E. (1999): Evolution and environmental impacts of the eruption of Laacher See Volcano (Germany) 12,900 a BP. Quaternary International 61: 61-72. Theuerkauf, M. (2002): Die Laacher See-Tephra in Nordostdeutschland: Paläoökologische Untersuchungen mit hoher zeitlicher und räumlicher Auflösung. Greifswalder Geographische Arbeiten 26: 171-174. Theuerkauf, M. (2003): Die Vegetation NO-Deutschlands vor und nach dem Ausbruch des Laacher See-Vulkans (12880 cal. BP). Greifswalder Geographische Arbeiten 29: 143-189. Theuerkauf, M. & Joosten, H. (2009): Substrate dependency of Lateglacial forests in the north-east Germany: untangling vegetation patterns, ecological amplitudes and pollen dispersal in the past by downscaling regional pollen. Journal of Biogeography 36: 942-953.